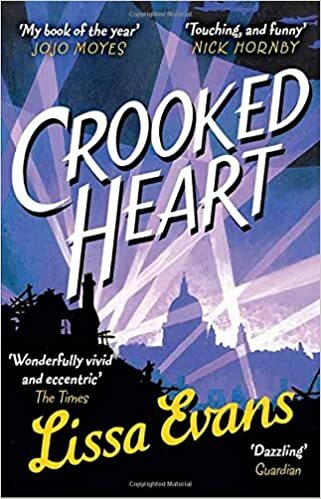 Crooked Heart was a very entertaining read showing that perhaps not everyone pulled together for the common good during WW2! Young Noel Bostock is a very intelligent young boy who has been brought up by his godmother Mattie, an ex-suffragette who has rather unusual ideas about educating her young charge. When Noel is evacuated to St Albans, he is billeted with Vera Sedge. She has had a difficult life and is struggling with debts. Desperate to provide for her lazy son and invalid mother, not to mention trying to avoid eviction, she doesn’t really care about what she does to make ends meet. Her son has avoided the draft due to a medical condition and he uses this unscrupulously to make some money too. When Noel comes to stay, he is drafted in to Vera’s underhand plans. The characters in this book were terrific. Mattie was such an eccentric woman providing many funny moments but also plenty moving ones. As Noel began to realise that she was ill, it was touching to see how he tried to become the grown-up in their relationship. Although Vera was involved in some frankly dishonest activities, at heart she was a good person just struggling with what life had thrown at her. I wasn’t overly keen on her son Donald at first, using his medical condition to help others in an unethical way and for his own gain, there was good in him too, particularly later in the book when he fell in love. But Noel is absolutely the star of the book. Clever and resourceful, he’s a bit of an outsider which is probably why he and Mattie had such a strong relationship. Lissa Evans has vividly recreated wartime London so I could really imagine the noise, destruction and fear experienced by those in the blitz. Although I imagine everyone has seen pictures of people crammed onto underground platforms during air-raids, I’d never really thought about what happened when they were full. I found the image of Noel trying to sleep on the steps of an escalator particularly poignant. Crooked Heart is a warm-hearted, often funny, look at getting by during wartime. In Vera and Noel, the author has created a twosome whose friendship was just what each other needed at that time. An unusual slant on the war story, I found this book hugely enjoyable. Crooked Heart was published in paperback and as an ebook by Black Swan on 31 December 2015. You can order a copy online here: Crooked Heart. Thanks to Sandra (Beauty Balm) for lending me a copy. When Noel Bostock – aged ten, no family – is evacuated from London to escape the Blitz, he winds up in St Albans with Vera Sedge – thiry-six, drowning in debts. Always desperate for money, she’s unscrupulous about how she gets it. The war’s thrown up all manner of new opportunities but what Vee needs is a cool head and the ability to make a plan. On her own, she’s a disaster. With Noel, she’s a team. Together they cook up an idea. But there are plenty of other people making money out of the war and some of them are dangerous. Noel may have been moved to safety, but he isn’t actually safe at all . . . So glad you’ve read this as I think it’s fabulous. Great review of what I thought was a fab book. I believe there is a follow-up planned. Glad you enjoyed this too, it’s a great book. I’ve got this waiting for me on my bookshelf. Glad you enjoyed it and thanks for the mention!